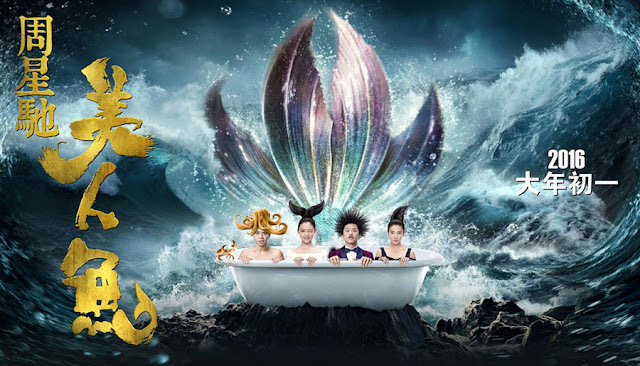 The plot is a fantasy concerning an unscrupulous businessman, played by Deng Chao, who uses sound waves to drive away dolphins from ocean front property, so that he can develope it. The sound waves have a devastating effect on a local mermaid population, so they plot to assassinate him. The plan involves sending Shan (Lin Yun), a beautiful young mermaid disguised as a human, to seduce and kill him. The first attempt fails miserably (and hilariously), so they then decide to have Shan lure him to their home, so that they can ambush him. A date is arranged and Liu Xuan, the businessman, is charmed by Shan’s innocence and naivete. Shan finds out that Xuan’s greed stems from an impoverished childhood and they fall in love. Shan sends him away from the ambush, but he is captured later on by the mermen and mermaids, who show him the effects that the sonic waves have on them. Xuan escapes with Shan's help, but the only person who believes him, is his business partner, Roulan, who becomes jealous of Shan and seeks to destroy her and her people. The two things that one can expect from a Stephen Chow movie are slapstick comedy and lots of CGI work. Chow is very good at presenting slapstick, and there are several laugh out loud moments. But he has also made it into a very effective love story. Deng Chao and Lin Yun create a strong chemistry together, and the couple holds your interest. The casting of Lin Yun as Shan is the result of a heavily publicized nationwide talent search. Contestants were voted for, online, before being selected by the studio. It worked. Lin does an excellent job of portraying Shan as a naive innocent. Likewise Chao is very good at showing his character's ascent from a decadent and debauched tycoon, to a man who finds out that there are more important things than money. Chinese computer effects have evolved impressively, over the years, and Stephen Chow has always made good use of them. In someone else's hands, they could overshadow the movie, but Chow’s emphasis on character and romance carry the film. The effects in Chow’s movies are usually cartoonish, but that is part of his humor. Technically the effects are well done, as you can see from the clip. The octoman is pretty cool. Although the environmental message, at times seems simplistic and heavy handed, it does not get in the way of enjoying this romantic comedy. Lin’s performance is very good and the special effects rival anything that Hollywood has to offer. The slapstick is spread through out the film, but Chow relies on romance more in this, than in previous films. This is one of his better movies.